Enhance arm and shoulder strength, control, and power by flexing your way to a more toned body with the 10-lb. Workout Shoulder Sandbag BBCH-2010 from Bionic Body! Built to be your new workout companion, this durable gear allows you to train your way to a more sculpted torso without having to leave the comforts of home. 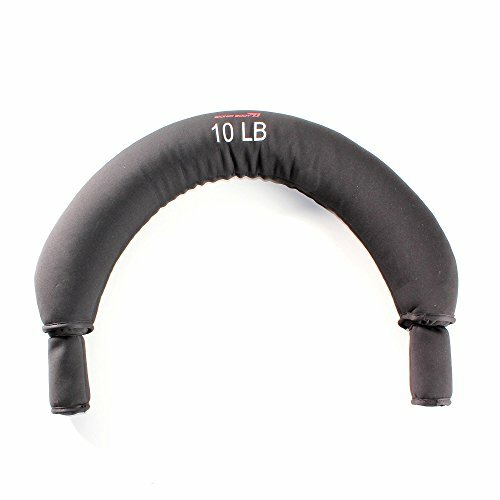 Whether you’re engaging in strengthening exercises or weight lifting routines, this 10-pound workout accessory is for you! Perfect for both fitness starters and gym rats, this fitness gear has a tube-like construction that comfortably fits over your shoulder and precisely conforms to your body, ensuring proper form when performing exercises. Its compact construction enhances mobility while improving comfort for hassle-free training, so you can tailor your workout according to your skill level. Target different muscle groups and develop a more muscular torso with this gear that can be used for conditioning muscles, developing endurance and stamina, increasing speed and agility, improving mobility and flexibility, and building strength. Constructed from soft yet heavy-duty neoprene, this equipment boasts superior durability and has a non-slip surface. It comes with easy-to-grip handles that allow you to hold the gear even when in motion, securely. You don’t have to worry about drenching the panels in sweat and making it extremely difficult to hold, thanks to the bag’s slip-resistant construction. Use this as a reliable gear for your circuit or high intensity interval training for intense workouts that will bring about your best shape. With this exercise weight, working out at any sport in your home will be easier. It measures at 40” x 5 x 3” and comes with 2-year manufacture warranty. PREMIUM NEOPRENE CONSTRUCTION - Built for efficient bodybuilding sessions, the shoulder weight boasts a high-quality neoprene construction that's soft, comfortable, and slip-resistant. Its textured surface ensures it won't slip even with sweaty hands. FORM-FITTING BAG - Designed with a tube-like construction, this 10-lb weight comfortably molds over your shoulder and conforms to your body to ensure proper form and its compact to enhance mobility while improving comfort for a hassle-free training. IMPACT-RESISTANT SURFACE - Featuring a soft yet resilient surface, this weighted shoulder bag has an impact-resistant construction that will not damage floors or mats. The bag can withstand shock while isolating the force within its surface. IDEAL FOR VARIOUS TRAINING PROGRAMS - Ideal for beginners and certified fitness buffs who are looking for a convenient exercise, this home gym equipment is ideally built for conditioning, strength training, toning, and cardio for a customizable workout. TWO-YEAR MANUFACTURER'S WARRANTY - The BBCH-2010 Workout Shoulder Bag comes with a two-year limited warranty to let you get the most out of your investment; providing a reliable workout gear guaranteed to be an excellent addition to your home gym.